The good folks at CSN stores have given me a $65 gift certificate for one lucky reader who lives in the US to spend at its online stores. CSN Stores has over 200 online stores where you can find anything you need whether it be wall art and decor, fitness equipment, or even cute cookware. Of course since our Aussie dollar has been so strong for the first time since the 1770s, I've been spending a little time online doing my bit for the American economy. I like to share the love around in the most economical way. And looking at my latest credit card statement I now believe I could be single handedly propping up the US economy. There are some great online stores in the USA! So, all you have to do is tell me where you like to shop the most (anywhere, online, offline) and the most intriguing answer will win. If you do not live in the US you can still enter if you want to surprise someone you know in the US with the gift. Enter as many times as you want ......it closes on Sunday 23 January. This is followed closely by a toy store that sells all the same toys I had as a child (yes, they could now be antiques if I had kept them...). The Kewpie doll in the picture above is from this store and is one of my favourite dolls. 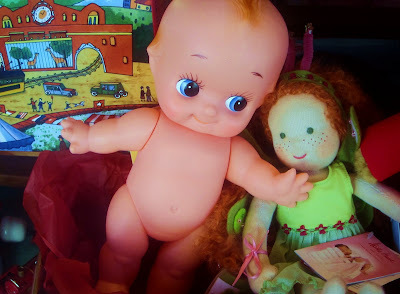 I love the store so much that I am now forced to bring up the subject of grandchildren to a certain child of mine because there is only so long a middle-aged woman can get away with playing with paper dress up dolls.....and avoid getting locked up.. So what is your favourite store? It is always great to find a store or two that you just LOVE, LOVE, LOVE! I used to go to a wonderful store called "Critters"...They specialized in wonderful Stuffed Toys--like the softest Bears you have ever ever seen, plus lots of Stickers, way before "stckers" were so popular...! This was back in the late 1970's into the mid 1990's.....I should call to see if they are still in business---I can't go there but I could ask the man who owned it "Bob" to tell me all about the sweet goodies they carry these days....! "Day Bear" that is in Morris Broderson's wonderful dear painting--I got him at "Critters"...! This Christmas I did all my shopping at Etsy.com. Thre are so many great stores on there and how fantastic that you can say the gifts came from talented craftspeople from all over the world. Such a brilliant concept. I will have to check out the CSN stores online though. I would have to go with the chocolate store at Hershey's Chocolate World! Yeah, its everything you think it would be with an overwhelming "chocolatety" smell even. They not only sell candy and personalized chocolate bars, but they make milkshakes with real ice cream too. And then when you are all chocolated up, you step outside and enter into their amazing amusement park. Yummy fun! intriguing you say - would it rate well if it was your favorite store to rob? Not that I would have such a list but I was intrigued to learn your thinking. So for those places where I spend money here's two of them. My favorite place to shop is our local farmers market. I love to get local produce and meats, as well as to support the local artisans. I also love the small local bookstore around the corner. Great places! I've been teetering and tottering back and forth and forth and back between the Nook at Barnes and Noble and the Kindle at Amazon. I do believe it's going to be the Kindle just because so many people are pointing (nudging) me in that direction. I don't suppose you've got one, too? I've heard Amazon doesn't charge freight to Hawaii. Could that really be true? I love to shop online at Fox Den Designs. Sounds like a neat name for a store, but doesn't tell you anything about their products, which are... BEADS. Delicas and Seed beads. They are very consistent with the quality that they sell and they have a wonderful selection, which isn't always easy to find. When you're creating an detailed piece of jewelry, you need good beads. What is it with women and shopping??? I mean... we need stuff, we buy stuff - what's to get so excited about? That doll is kind of spooky! I can't enter the give-away.. but good luck to all. I wish there was a toy store like that here in Oregon! My favorite place to shop is unconventionally the local Goodwill. It's a treasure trove of items that beckon me to browse every aisle from the clothes, books to games and kitchen knick knacks. I've found some wonderful things that were donated. I usually walk away feeling satisfied. But I think my two favorite places are less than glamorous-- I like to get up at pre-dawn and head downtown to the Flower Market which all the retailers (buying wholesale) shop. It's a block size warehouse filled to the rafters with flowers. Even when it's still dark outside it's one of my favorite places. I roam around until later in the morning when you're allowed to buy the flowers "retail" which is still way less expensive then the retail flower shops. After filling my car with flowers wrapped in newspaper, I head over to the garment district and and shop for cotton fabrics to make quilts with. There are blocks and blocks of tiny stores and one great big one. It's a field day full of fabric and flowers and my idea of perfect shopping. My favorite stores are usually thrift stores, but there was one that used to be awesome a few years (like 15 years) ago. I used to go in there and get a huge bag of the best stuff for like $5 or $10. Once I got some 70s nightclub/bar candle holders (with the sparkly glass globe) that had apparently come from an actual disco (where they had spent the intervening years, I don't know); I amassed a huge collection of 60s mod dresses and 70s synthetic printed Oxford shirts (you know, with the outrageous motifs--one had ships in bottles all over it). That store used to be awesome before people discovered it (and let's face it, now that 80s items are vintage, thrift stores aren't what they used to be)! Online, I like to shop at Amazon. I can get books for my Kindle! I love to shop online, but if I want a deal I head to http://www.hip2save.com and click on stores. Then click on Target... I print Target coupons and bring manufacturer coupons and snag awesome deals! My $150 receipt was dwindled down to $50! Now, if only I could do that for something other than food products! My Emma NEEDS a booster seat for the car and they aren't cheap!